/ blog / From Olympic Glory to Battlefront to… Tourist Attraction? From Olympic Glory to Battlefront to… Tourist Attraction? In winter 1984 Wolfgang Hoppe and Dietmar Schauerhammer of East Germany zoomed down the Sarajevo bobsled track to win Olympic gold. 31 years later it was my turn to come crashing down – into Dan’s back after unsuccessfully attempting to balance on the Sarajevo bobsled track wall. 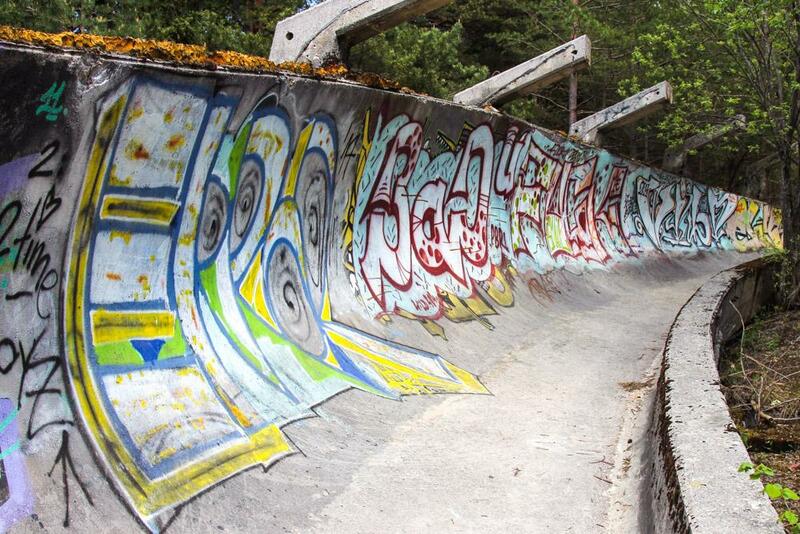 Olympic tracks are not playgrounds. Okay, so it’s not a playground, but then what is it? Because it’s certainly no longer looks fit for bobsleds. I’m sure this isn’t the first former Olympic site to fall into disuse (how is Sochi doing these days?) 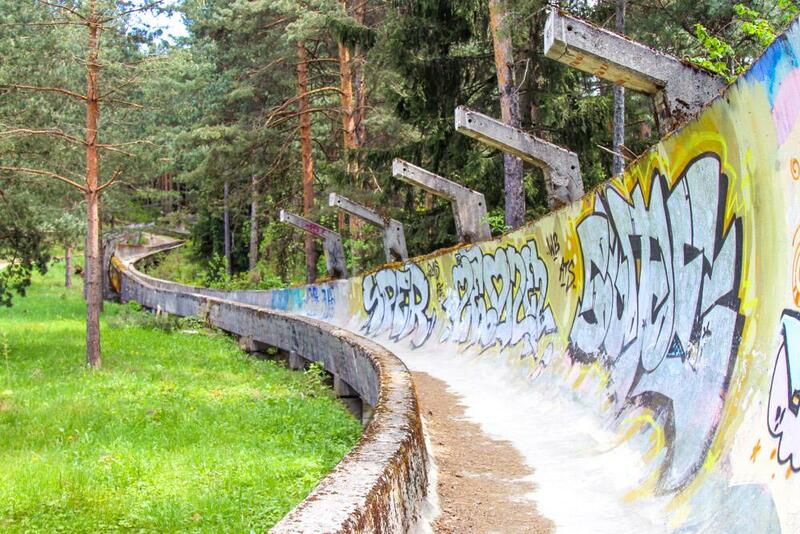 but I can’t imagine many are now quite as eerie as the Sarajevo Olympic Bobsleigh and Luge Track. 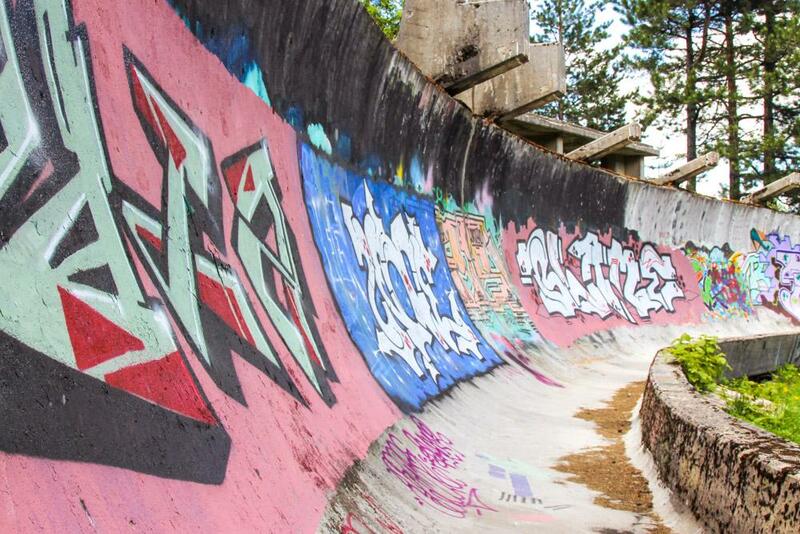 Because while the abundance of moss and graffiti betray the bobsled track’s age and disrepair, the many bullet holes and sniper windows quickly remind visitors that this is not just the site of an Olympic game. 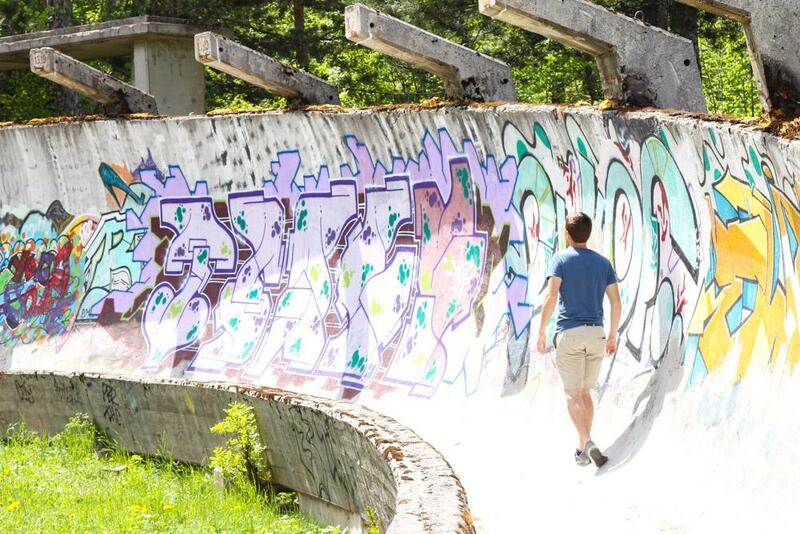 It took Dan and me about an hour and a half to walk up to Sarajevo’s old bobsled track (we were told it would take 3 hours, so I’d like to think that we’re just super fast and fit, but that somehow seems unlikely). 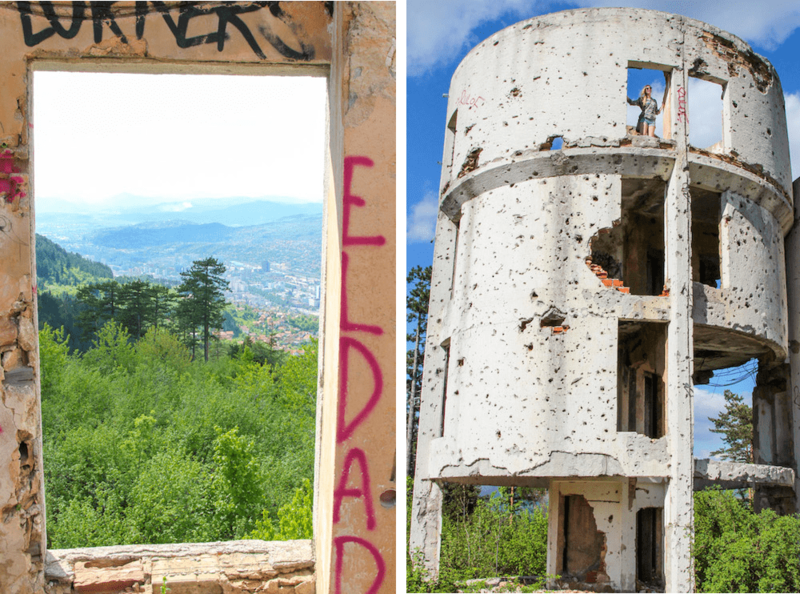 Even if abandoned sites aren’t really you’re thing, the walk itself is worthwhile just for the beautiful views over Sarajevo. 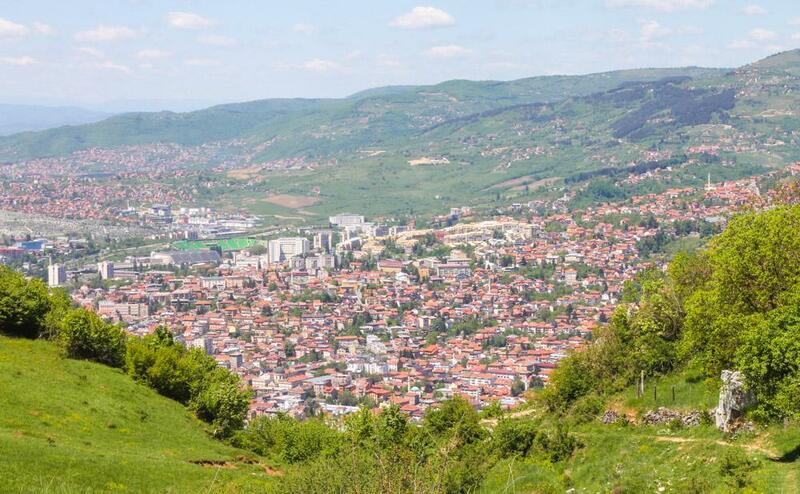 Plus it’s pretty amazing to watch Sarajevo thin out over the steep climb. This must be one of the only countries in the world where you can live in the capital and have haystacks and chickens in your backyard. 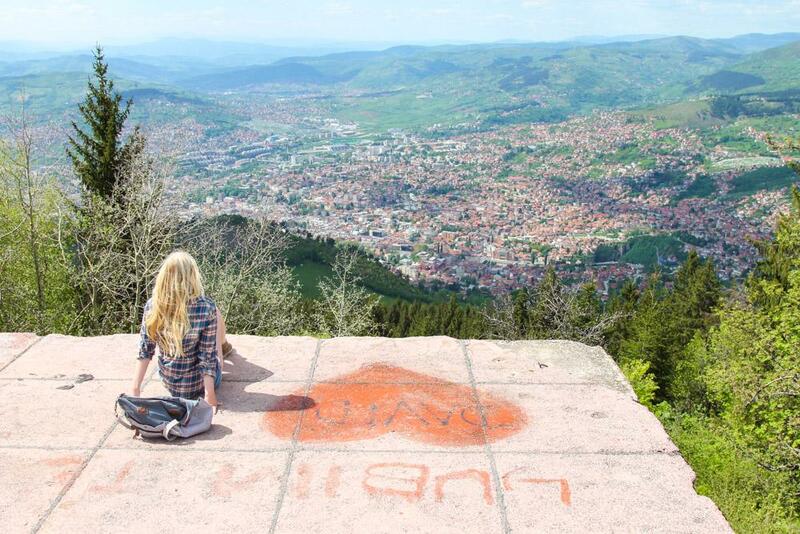 Um, can I move to Sarajevo, please? 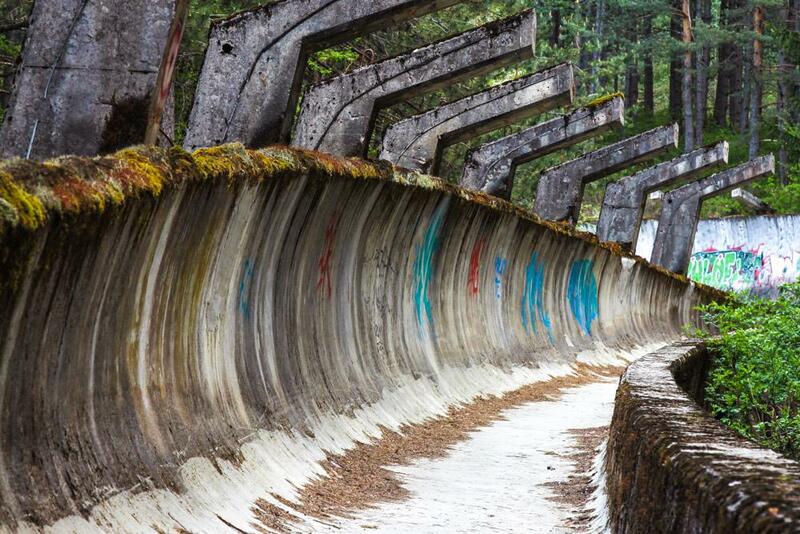 When we reached the bobsled track Dan set off to take 400 photos, while I sat down to dig into a bag of pretzels. Climbing a hill mountain is draining! We spent about an hour just walking up the track (and taking a billion blog photos, of course) and I found it so hard to imagine it in its Olympic glory. So once I got back to my hostel I had to do some Youtubing back to the 1984 Olympics. Could this really the same place? 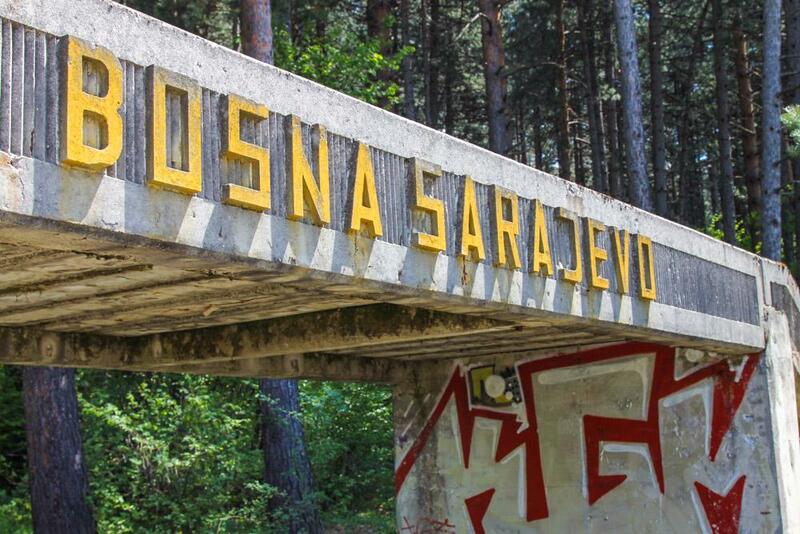 Bizarrely, it was less difficult to imagine the Sarajevo bobsled track during the Bosnian War. I guess there’s a shooting range or something nearby, because throughout most of the walk I could hear gunshots. Plus, while the track itself isn’t so damaged, the buildings nearby the finish line are. 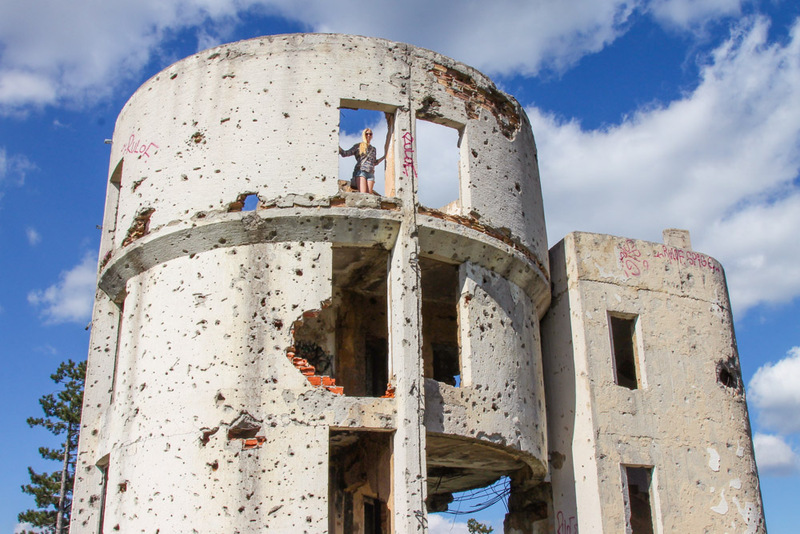 And when we reached the top of the track we walked farther up the hill to find an abandoned restaurant with, in typical Sarajevo fashion, a disconcerting mixture of heartbreaking reminders of the war and absolutely stunning views. 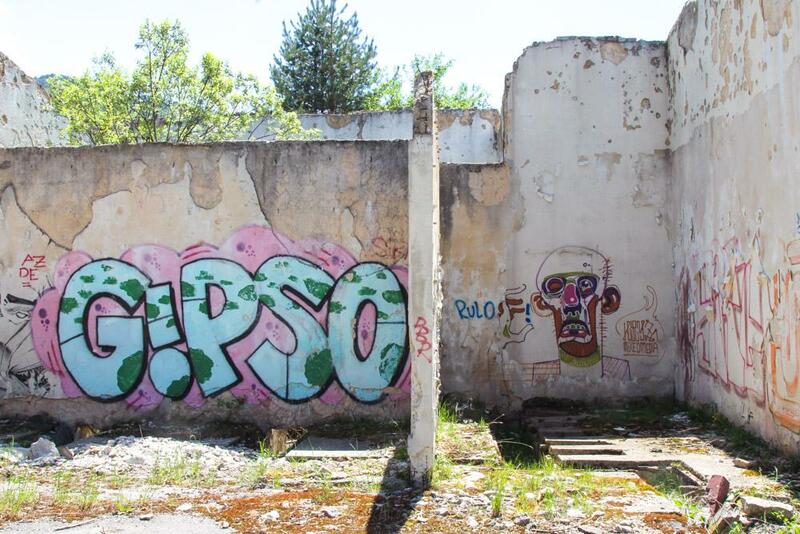 You get me every time, Sarajevo. 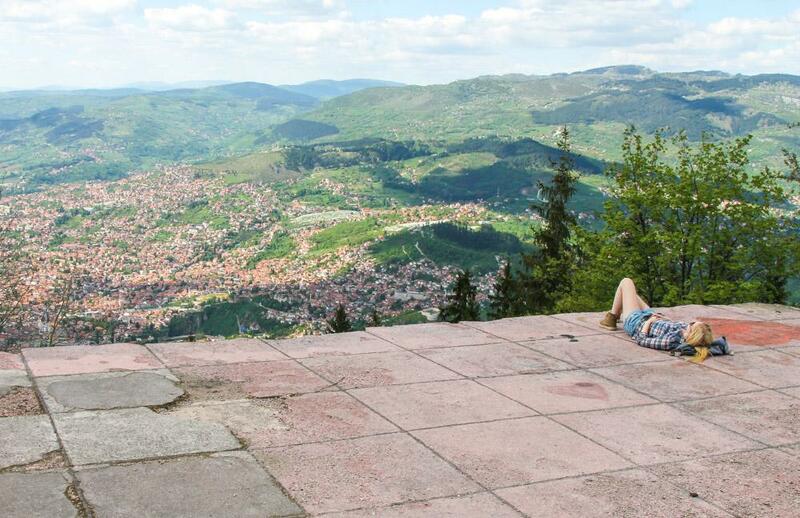 Like, Sarajevo has definitely made it to the top of my list of favorite European cities. I mean, these views! We simply followed Google Maps on my phone up to the bobsled track, though it probably would have been easy enough to find without a map as well. Just walk straight up from the city center! 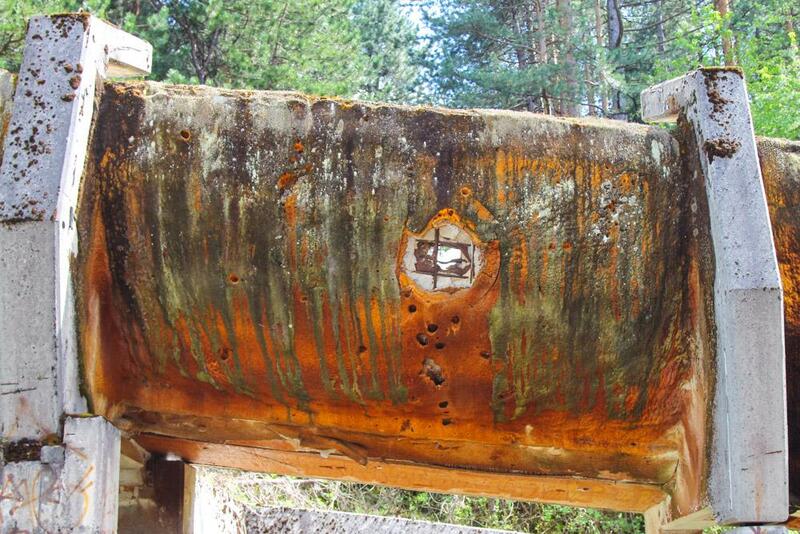 Do you seek out abandoned sites while traveling? Any favorites? 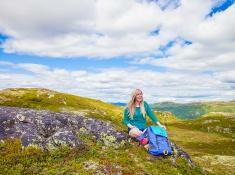 Norway on a Budget: Eating Cheaply! 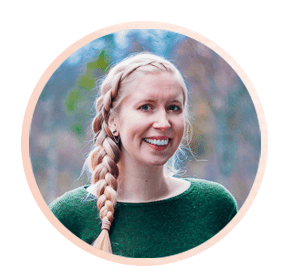 Yours is one of the more recent blogs I have found regarding this tour… I am hoping you can offer a wee bit of advice. I am spending about 18hrs in Sarajevo later this month… obviously including overnight. By the time I arrive it will be almost sunset, so am hoping to check out some of the more central venues before it gets too dark, but I would love to head up to the bobsled track in the morning. I’ve got to leave on the 10.21 train, so reckon if I get a taxi up and back I should be okay. Do you know of the best way to arrange this, or if it is feasible? Sunrise appears to be shortly after 7am, so I will be up and about early to get this done. Obviously a bit wary of being a single traveller trusting a taxi driver to take me up and back into hills as it were. Anyways, any advice would be brilliant. I would ask at the hostel or hotel you’re planning to stay at. I know my hostel organized this, so hopefully they can help you organize a taxi in advance, or set it up for you when you get there. I saw a few tourists who took taxis up to the track, but I walked up so I’m afraid I can’t offer more advice than that. Good luck and have fun! That place looks so much more creepy in summer than when I was there last winter. Everything was covered in snow! I feel like I should go back after seeing this post! Definitely an interesting stop! 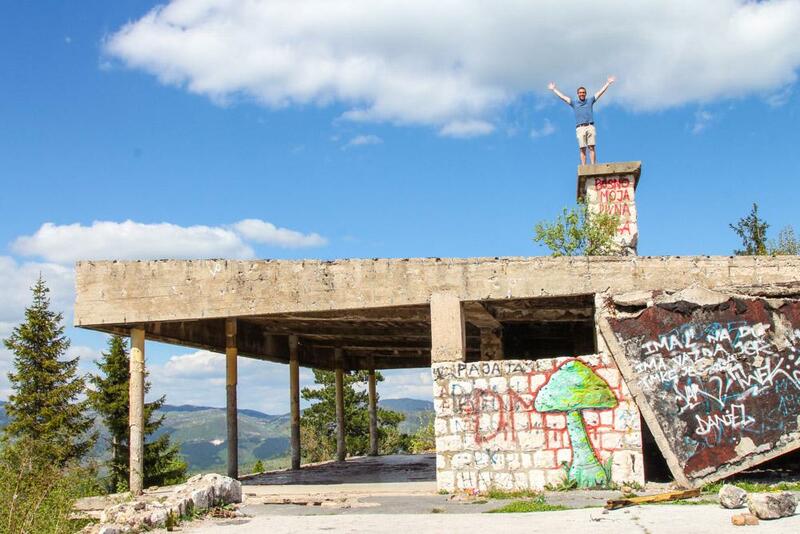 We also went to the abandoned hotel and the ski jumps. The hotel was pretty eerie. Seems like you had great weather though! I do really like abandoned places, I don’t know why… It’s just weird to think this track once hosted a huge event, and now you guys can roam on it freely. And oh, sitting on that platform overlooking the city looks like a magical moment! Right? 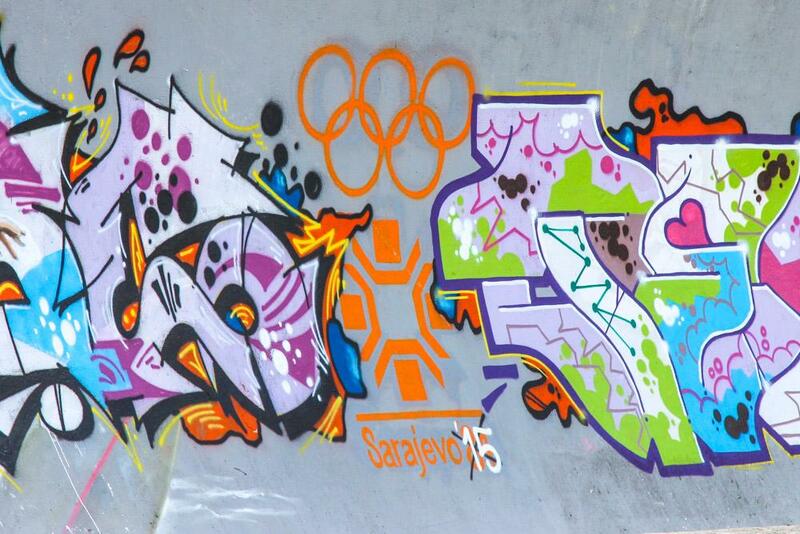 It’s so strange to think that the Olympics were actually there – I could barely imagine it. 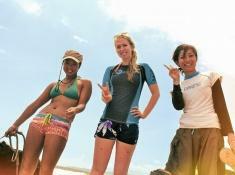 There are so many reasons to go back! Really lovely photos in this post! 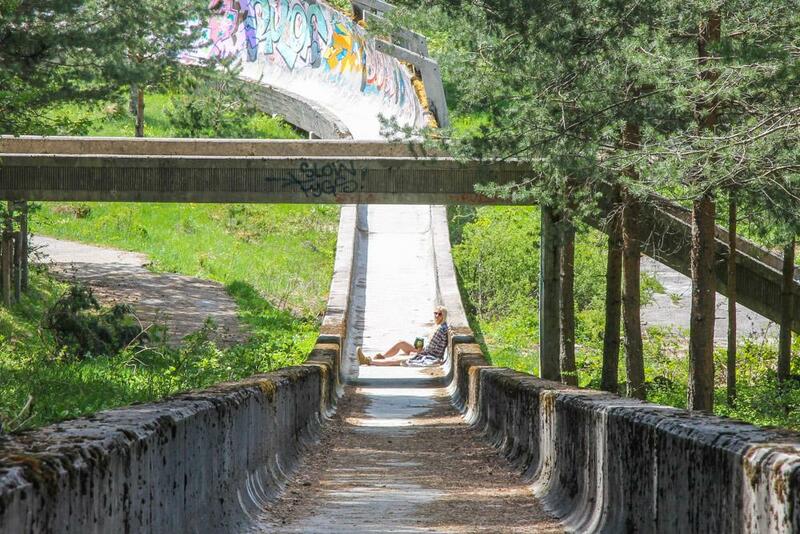 I am heading to Sarajevo in August, and this bobsled track is definitely a place I will be heading. I had no idea you could walk up there, so that’s great to know. Were there many other people there? I imagine the eeriness would be reduced somewhat if, while walking down, you had the pleasure of overhearing conversations about what Timmo got up to at the hostel’s pubcrawl last night, or whether an afternoon snack now or waiting for dinner is the better option. You know how it can be! Haha we did run into a few people while walking around the track, but it was mostly empty, especially the higher up we walked. I think most people just take a taxi to the track and walk around where they’re dropped off instead of going all the way to the top. You should definitely check it out! 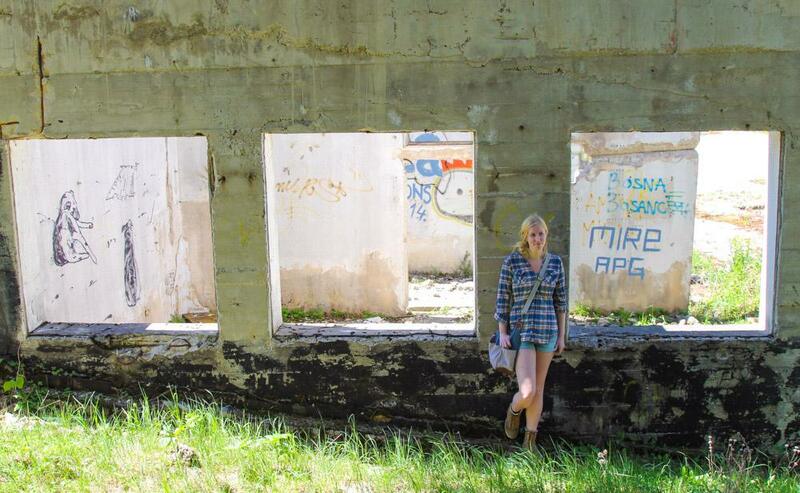 I am all about finding abandoned areas when I travel (the abandoned ski lift in Sochi was unbelievable!) so this is like a dream for me! Those views are unreal! 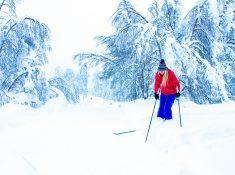 Sochi’s abandoned ski lift does sound fascinating – I would love to see it! I am obsessed with this! 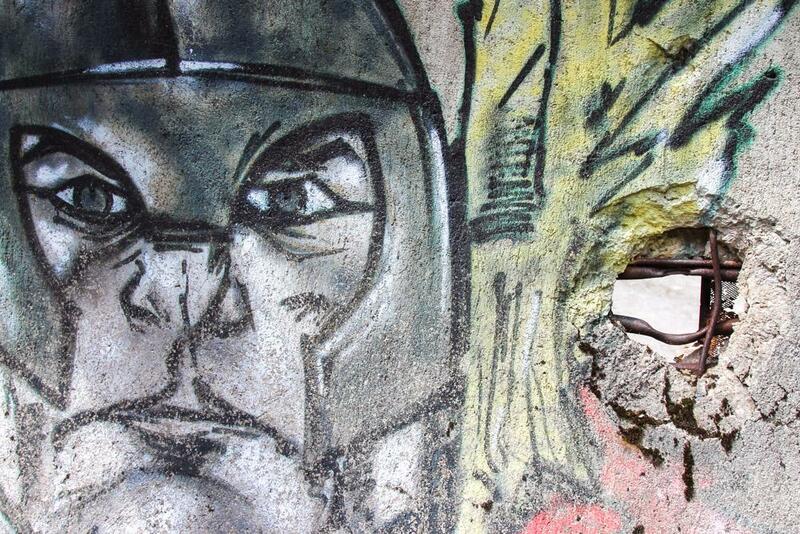 I don’t ever intentionally seek out abandoned places when I travel…though clearly I should! 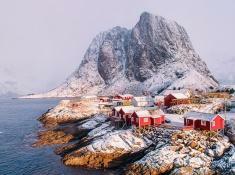 But this is exactly the type of place I love stumbling across when I’m traveling. So cool! Abandoned places have such an interesting feel to them!